“Good afternoon. I want to talk briefly today about an idea for a new Boston Global Forum program. The program would aim to recognize and encourage global citizens. An outline of the proposed program is provided in the handout. 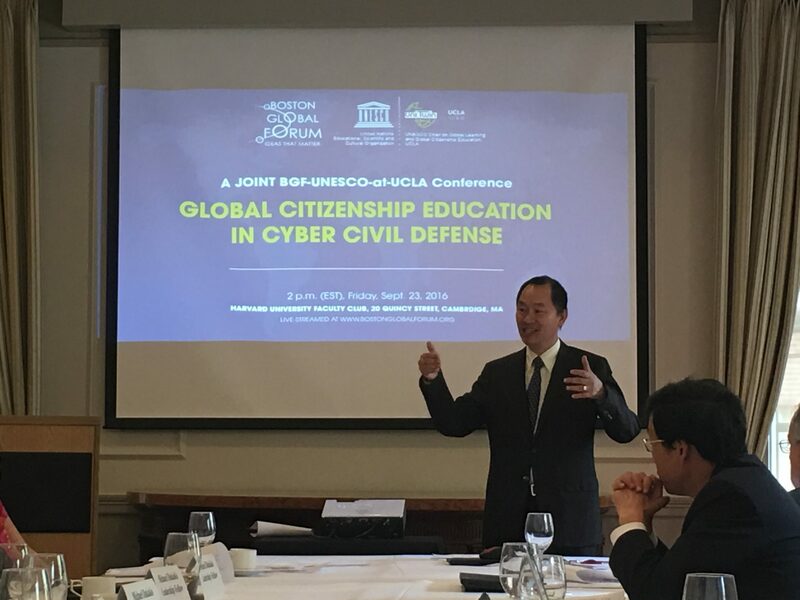 The Boston Global Forum is partnering with UCLA in on Global Citizen Education. The question is what BGF can do for its part. What’s being proposed is a program that would identify GLOBAL CITIZENS, acknowledge their status, connect them through a network, and encourage them to take a leadership role in Global Citizen education. The program would be conducted entirely through the Internet. One component would be a GLOBAL CITIZEN SCORECARD. Scorecards have found regular use in recent years as a way to measure individual achievement and progress. In our case, the SCORECARD would test whether individuals have the values, outlooks, and behaviors associated with global citizenship—for example, whether they respect and show tolerance of those who have different political or religious affiliations than the ones they hold. The SCORECARD would be self-administered online. Those who score too low to reach the required threshold for designation as a GLOBAL CITIZEN would be directed to instructional materials that would help them to understand what global citizenship requires and what they can do to become a GLOBAL CITIZEN. On the other hand, for those who score high enough to meet the threshold for GLOBAL CITIZEN, they would be asked to provide their name, country, and email address. When they do so, they would be directed immediately to a web page that has a printable GLOBAL CITIZEN CERTIFICATE with their name on it. The CERTIFICATE would also bear a unique number, modeled after the U.S. social security numbering system. One of the numbers would designate their country. These GLOBAL CITIZENS would then have access—using their email address and number—to a network comprised of others who have achieved that designation. The network is the key. The certification process is designed to recognize those who have the values and perspectives of a GLOBAL CITIZEN but it is the network—the interaction between individuals across the world who share those values and perspectives—where their commitment to global citizenship would be strengthened. This network of citizens would complement the network of thought leaders that we’ve been building through the Boston Global Forum. Among the resources that would be made available to those in the GLOBAL CITIZENSHIP EDUCATION NETWORK would be those of BGF and UCLA’s Global Citizenship Education Program. Another component of the proposed program is a leadership initiative. It would be open only to those who are in the GLOBAL CITIZENS NETWORK and would aim to encourage them to take a leadership role in bringing the perspectives and values of global citizenship to others in their community. Here again, we would have a certification process that would test and recognize leadership. We are thinking of different leadership levels—Bronze, Silver, and Gold—modeled on the format of the Olympics. Demonstrated leadership in global citizenship, and at different levels, would be required for a GLOBAL CITIZEN to receive one of these designations. And as with the GLOBAL CITIZEN NETWORK, we would create an online network consisting of those at each leadership level. The assumption here is that their leadership will be reinforced and enhanced through contact with those with a similar level of commitment. So that’s a general outline of the program that we are considering. If you think the program has merit, we will prepare a fuller description of it, including a draft version of the SCORECARD, for our December meeting. If we were to go ahead with the program, it would take time to develop the software and instructional materials that would be required. Nevertheless, we think the program could be operational sometime in 2017.